This is a guest blog in partnership with Mention. Did you know that, as of January 2019, there are about 7.7 billion of us walking the earth? It sure is a lot of people. Now, according to the Global Social Media Research Summary (2018), 42% of the world’s population is active on social media. That’s about 3.2 billion people. Above all, this is an incredible opportunity for all types of businesses: they now have a way to reach billions of people in a matter of seconds. It requires an active presence on social media, an engaged community, the right timing, a dose of creativity, a lot of patience, and a teeny tiny bit of luck. If it was that easy, every brand would be knocking every single one of their social media campaigns out of the park. 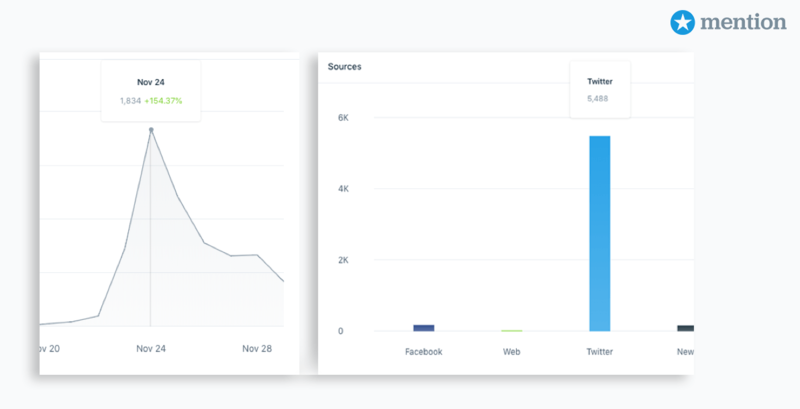 With that said, I’ll share 5 of the most successful campaigns and strategy you can learn from to build your 2019 social media plan. Let’s start with Oatly’s surprising hybrid campaigns. Oatly is a Swedish company manufacturing and distributing oat-based food and drinks. Their objective? To satisfy their consumers, and save the world. Pretty cool. It may come as a surprise for you (if you’ve never heard of them), but Oatly has been around since 1985. If you’ve heard of them only recently, it’s probably because they revamped their entire communication process. In fact, they went through a complete rebranding a couple of years back, and re-invented the way they market their products. Following the rebranding, Oatly experienced a 50% increase in sales, without changing their products in any way. This is partly due to a super-duper smart social media communication plan. As an example, they sometimes use social media to promote their real-life display ads. And they do it very well. Here’s an example of a hybrid campaign they promoted via Instagram in September 2018. They put up several consecutive posters in metro stations so riders would continue to see their campaign as they commuted. Then they made a video about it. Then they made a Instagram post about the video. Oatly’s content matches what their audience likes and their expectations. A fun and cheeky, yet ambitious message about their product, how it’s different from the competition, and how it contributes to save the environment. They took a simple idea and maximized its use. There’s no argument. Spotify is one of – if not the best – music streaming service in the world. As of November 2018, they announced that they had 87 million paying subscribers. And this has nothing to do with luck. Part of Spotify’s success comes from the care and love they share with their users. They focus on creating a community around something all their users love: music. If you’re a Spotify user, you’ve likely been targeted by the #2018Wrapped campaign in early December 2018. All Spotify subscribers were offered a wrap up of their year in music. Which artists did they listen to the most? Which songs did they listen to? How much time did they spend listening to music via Spotify? Which genre is their favourite? I too learned that, I’ve spent 34,368 minutes (or about 24 days) listening to music on Spotify in 2018. Because it’s personal, fun (and the Internet usually falls pretty easily for fun stuff), and engaging. With this campaign, Spotify delivered millions of personalised reports, and all that users had to do was to press the share button to show their activity with their friends and followers. Even though we all have different tastes in music, Spotify managed to bring their community together around one single hashtag for a couple of day. And we think that’s worth mentioning. 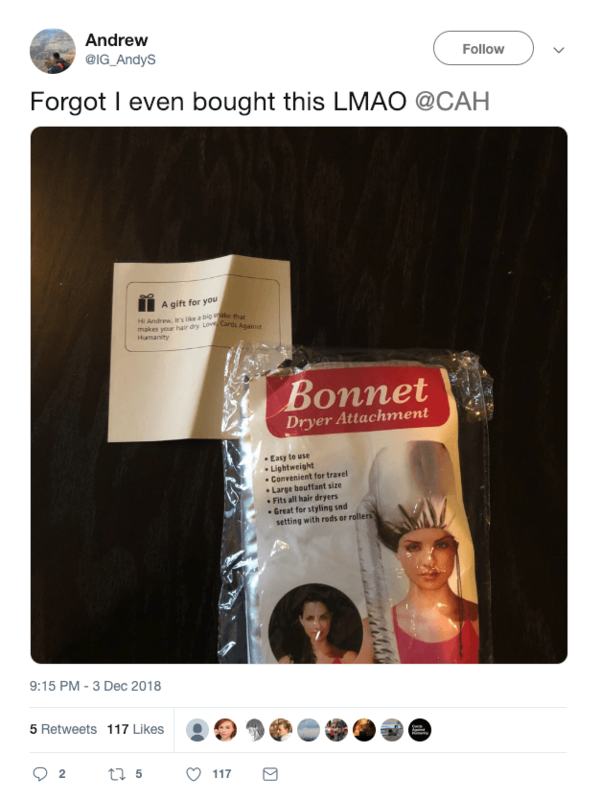 Christmas may seem far from us right now, but it doesn’t mean you shouldn’t start thinking about your Christmas 2019 social media campaign. To do that, I decided to pick the most watched Christmas Ad of 2019 on YouTube: Share Your Gift. During a three minute animated film, Apple shared a great message to those who create great things but are too shy to share them with the world. A moving video enhanced by a great song: “Come out and play” by Billie Eilish. What’s not to like? This is the most seen 2018 Christmas ad on YouTube. It’s relatable, inspiring, and has all the elements of a good holiday campaign. At the time I’m writing this blog post, it totalled 22 millions views. That’s only 2 millions views behind Apple’s iPhone XS and XR introduction video posted … 4 months earlier. It’s fair to assume it will gather more views in the coming months. Also, this is a very smooth move from Apple. They promote their products, gave a shout out to Supreme and put their Apple Music service forward via a link directing to Billie Eilish’s song in the description. All in all, it was a classic feel-good campaign done right – bravo Apple. Once in a while, there’s a brand doing something crazy enough to break the Internet. Cards Against Humanity is one of them. 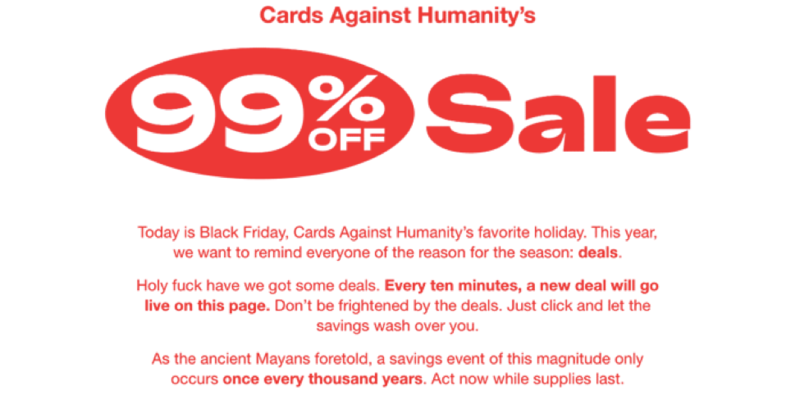 As the game’s manufacturers say it themselves, CAH is a “party game for horrible people”. Each round, a player draws a card on which there’s a question or an incomplete sentence, and everyone else has to answer the question or complete that sentence with the funniest card they have. What’s more, CAH’s teams sure don’t lack imagination. 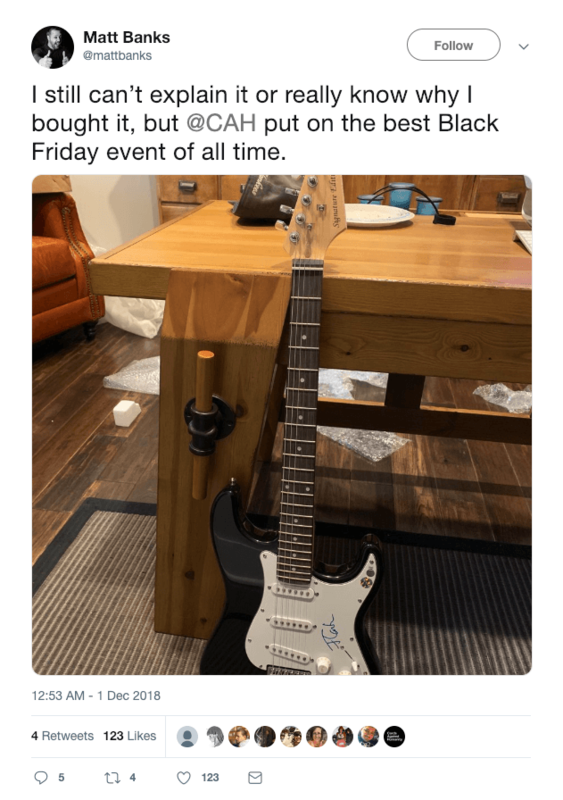 After digging a hole (for no apparent reason) during Black Friday in 2016, they held a 99% Off Sale campaign of random items for Black Friday 2018. You read that right: 99% off. You could get highly coveted items such as a Ford Fiesta or a life-size cut out of Orlando Bloom at prices that were unheard of. As one could expect, this resulted in a sudden increase of mentions around “Cards Against Humanity” on the Internet (most of it coming from Twitter conversations). A week after the PR stunt, people started to receive what they bought, and they obviously shared it on social media too. A brand new guitar at 99% off. A $20 bill for $0.20. Because it’s one of the craziest PR stunts we’ve ever seen (so far)! 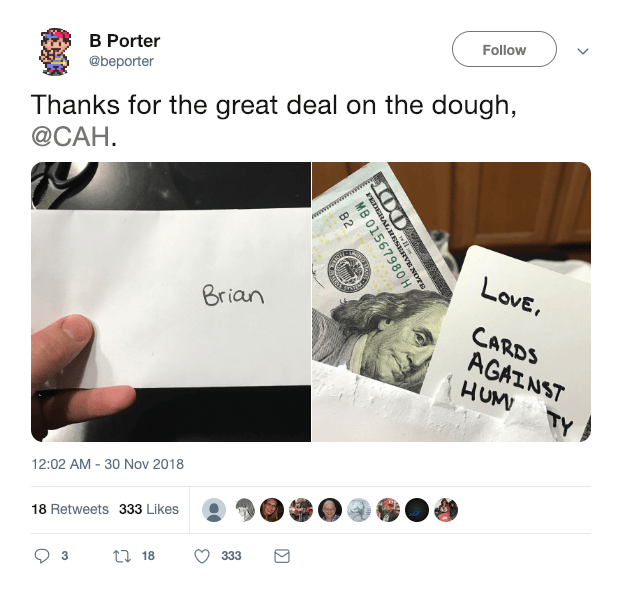 While this was probably very expensive for @CAH, it’s only fair to assume that they got an equivalent amount of PR from it. Brilliant. Another great campaign we loved all throughout 2018 comes from GoPro and their incredible user generated content machine. They have always encouraged their users to share their crazy footage filmed with their GoPro equipment. In 2019, consumers trust other consumers more than brands. In fact, 84% of consumers trust online reviews as much as they would trust their friends. On the other hand, a recent study reveals that 69% of adults (in the UK) don’t trust advertising. Simply put, there’s no better way to market a product than by having consumers marketing it for you. That’s why GoPro, rather than creating all the content shared on their own social media channels, share a lot of UGC. Here’s a couple of #GoProPets posts that caught my eye. We often hear that without their customers, businesses are nothing. GoPro illustrates this perfectly. They mostly built their success with their users’ footage, showing the incredible quality of their products. Users are rewarded when GoPro selects their footage. Before you go, check out this UGC video from 2014. I can guarantee that it will make your day better. If you’ve been in the marketing and communication game for quite some time, you know that a social media strategy is no longer a nice-to-have. Your success depends on it, regardless of your industry. Publish the right content at the right time, and you can reach millions of people – just like that. The bottom line? Take the time to look at what your competitors and partners do, and make sure you do better.